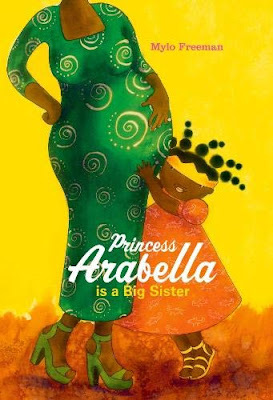 When you know you're going to have a little brother or sister, it can be an exciting time and in the fabulous "Princess Arabella is a Big Sister" by Mylo Freeman, Arabella can't wait to find out what's going to happen when her new sibling is born. The thing is, Arabella can't quite decide which would be more fun. A baby brother to boss around and play with? Or a little sister to turn into a princess and dress up. Arabella thinks she'd prefer a little sister until she meets Prince Mimoen's sister - Eeek, OK perhaps a little sis wouldn't be that great after all. So how about a little baby brother then? But when she meets Princess Ling's brothers, they seem to kick up a heck of a rumpus and seem like too much trouble! It's a lot to think about - but what do do Mum and Dad have in store for Princess Arabella? One thing's for sure, it's going to be fun finding out. The perfect book for children who are about to become big brothers or sisters themselves, with Mylo's absolutely glorious observational eye giving this book a real lift. Sum this book up in a sentence: A gorgeous diverse book celebrating the excitement (and a tiny bit of anxiety) around becoming the older sibling. "Princess Arabella is a Big Sister" by Mylo Freeman is out today, published by Cassava Republic (kindly supplied for review).